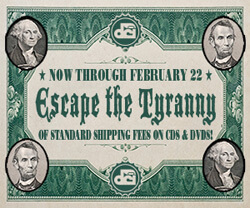 In celebration of Presidents' Day, Drum Corps International has been offering free domestic ground shipping on its entire collection of CDs and DVDs. Don't miss out on this last chance to stock your collection before the summer comes and the 2009 Drum Corps International Tour is here. This promotion only lasts through Sunday, Feb. 22 at 11:59 p.m. ET, so act today before this deal, like all the Presidents who have come before it, is in the history books! Visit store.DCI.org to shop today.